Alfaro Garcia v. Johnson is a class action lawsuit filed on behalf of thousands of immigrants fleeing persecution who have faced months of detention while they await reasonable fear determinations. U.S. law mandates that when individuals who have been previously deported from the United States are apprehended by the Department of Homeland Security and express a fear of returning to their countries of origin, they must receive a reasonable fear determination within 10 days as to whether their fear is reasonable and whether they can proceed with a hearing on their application for protection before an immigration judge. The U.S. government has violated this law in thousands of cases where individuals have waited for three months or more, usually while detained, for their interviews and decisions. Because individuals who receive positive determinations are not automatically eligible for release from detention, the delays in receiving reasonable fear determinations further extend the often lengthy period of detention individuals already face during the rigorous asylum process. Learn more about the case in charts and numbers and read our plaintiffs' profiles. October 27, 2015 The court granted final approval of the parties’ settlement agreement. 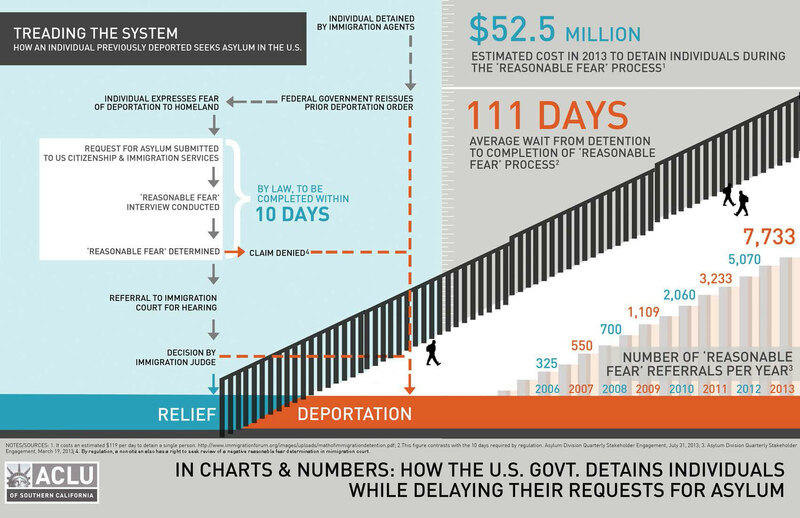 Because of the settlement, individuals who express a fear of persecution in their home countries and who must go through the “reasonable fear determination” process will have their case referred to USCIS within an average of five days, and USCIS officials must decide whether that fear is reasonable within an average of 10 days from the time the case is referred. Read a practice advisory regarding the settlement. USCIS and ICE, the federal agencies in charge of processing these asylum seekers’ claims. Under the settlement, individuals who express a fear of persecution in their home countries and who must go through the “reasonable fear determination” process will have their case referred to USCIS within an average of five days, and USCIS officials must decide whether that fear is reasonable within an average of 10 days from the time the case is referred. Read the settlement. A federal court judge has certified a nationwide class, and rejected the government’s motion to dismiss. Read the decision.